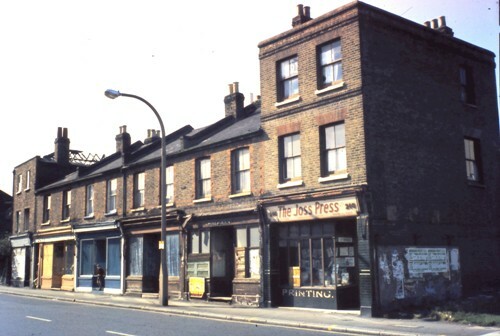 Quentin Pickard has provided this colour photo which he dates to around 1976, 'what a lot of dilapidated and sad set of buildings there were then in the High Street'. It shows numbers 241 to 246 High Street, the rafters on no. 241 visible. Numbers 242 to 245 are matching, double-fronted shops with recessed entrances and no. 245 has the name 'H. Newman'. The same parade features in three photos from 1966, (the page also includes links to earlier photos of no. 245). On the original image it is possible to make out a Morning Post notice on the side of the Joss Press at 246 advertising 'Stackridge'. There was a group of this name which split up in 1976.